I once spent a fantastic evening at an arcade/gamer bar in Melbourne, talking to a mish-mash of pagan acquaintances, psychology majors, and friends-of-friends from the Computer Sciences circuit. We talked, as one does in a gamer bar, about video games: the psych majors elaborated on Skinner and Sartre and the psychology of immersion, the comp-sci types chattered enthusiastically about game engines and the Dream Rig they’d build one day, the pagans discussed the influence of various world mythologies on the character archetypes of assorted fictional deities. Inevitably, Vivec came up, and Morrowind with them, pushing past my teeth as though I couldn’t avoid spilling my fond zeal across the table. Various stories followed, shyly, half-shamed, as though made vulnerable by revealing such secrets: using a chalk mod to scrawl self-made sigils of protection and prayer, lighting specific incense every time they played, stealing soul stones from enemy NPCs and delivering them to the nearest ALMSIVI shrine so the souls inside could be put to rest, collecting every last book of Vivec’s holy scripture and memorising as much as they could. The most common thread was a kind of awe for this place, and the instinctual ‘rightness’ of behaving accordingly in-game: in the half-trance state of their immersion, the world felt real, the gods felt real, and they had all built their own rituals to honor that reality. All thinking that they were the only ones. The core of our table’s fascination, of my own, lies in the religious aspects of Morrowind: the glory and intrigue of the ALMSIVI, of course, but also the nearly sixteen years of community discussion and study, countless fans with all the passion and fire of dedicated theologues. We speak of Vvardenfell’s cities and geography with a topophilic adoration bordering on worship, we call it Home more often than we do not. This game, this place and its people and its countless stories, left such an indelible imprint on so many, that we couldn’t help but become evangelists and scholars of its world. And in particular, always, Vivec commands our fascinations, our attention and our curiosity, demands them still after all this time. The Sermons alone have well-occupied the greater legions of the lore community for a decade and a half, and still ignite fierce debate and new suppositions almost every day; what other invented hierography can boast the same dedication? For a fictional god, Vivec has inspired an impressive body of work in their name. However you come to them, the Poet changes you. The intersection of video games, psychology and modern paganism is fascinating to me. Studying academic accounts of this intersection is rewarding, of course, but what I really love to hear are things like the stories from the bar: those seldom-admitted accounts of players forming their own rituals with, and within, their interactive media. Bear with me, dear reader, and look into yourself: isn’t there some habit you’ve developed, some otherwise-unexplainable extension of your belief in the worldbuilding, that feels more personal than simple immersion? Something without which your play session just feels ‘wrong’? Perhaps, something you don’t feel comfortable sharing with other players, for fear of looking foolish or unstable? You’re feeling a bit weird now, aren’t you? Whether you hold any spiritual feelings whatsoever, whether you believe in any capital-m Magic or not, the mind absolutely loves building routines and rituals, and faith in any of those rituals is completely optional. How players interact with, and even display a real reverence for, the habits of entirely-fictional cultures (especially when no one is watching and there are no repercussions or rewards for their actions), speaks volumes for the quality of Morrowind’s worldbuilding, and for the natural human instinct towards ritual, even if the reason for said ritual is based on their sense of immersion. Some players enjoy collecting coda flowers, leaving a few at each Tribunal shrine they run across, just because it feels good and right to do so. Some unequip their character’s shoes and helm whenever they enter a home or a Temple, just because it feels more respectful to the spaces their character is entering. Maybe they develop a superstitious attachment to a particular amulet, keeping it equipped even when strategically-superior choices are available. Our brains often treat mock ritual as real, release certain rewarding neurochemicals that make us feel safer, more secure, more prepared, bonded to greater structures or, simply, luckier. The line between simple roleplaying immersion, and honest-though-faithless personal ritual, is debatable and blurred, unique to each player, but ritual itself is a cognitive imperative. As for myself, I have a special save file which I’ve kept for six or seven years, on a keychain USB drive. It never changes, never gets overwritten by a fresher save, contains no mods. It is always the 13th of Rain’s Hand, my birthday. It’s raining. My character is standing before the Ash Mask of Vivec, in the Gnisis Temple, flanked by dutiful Ordinators. With the right headphones, it’s a simple thing to boot up my save file and have my own virtual space already prepared, complete with soothing ambient sounds to drown out surrounding noise. The Ordinators by the altar are easily adapted and folded into meditation sessions as ‘guardian’ visualisations, an idea or image of protection to ease the way into a clear and undisturbed trance state. I have peace and safety here, a quiet place I can carry with me, useful even without a computer to access it: the physical aspect of the space is carried in the USB drive, which by extension can be used to ground myself, touching it like a worry stone or a rosary. Between my fingers, I hold a whole world. How does it make you feel, hearing this? Weirded out? Uncomfortable? Reassured? Would you call this a ritual or a coping mechanism? Can you tell the difference? Does it matter to you that my character, the avatar of my will and intent, is so specifically positioned towards the Ash Mask, a relic of Vivec? Does it seem purposeful that I chose Gnisis as the location, when I could just as easily have chosen the familiarity of Balmora, or the glory of the High Fane, or in Vivec’s very chamber itself if it so pleased me? Why do you think I’m telling you all of this, this secret and deeply-personal unorthodoxy? We’ll get there. Be patient. The Lord of the Middle Air, the Angel of Veloth, the Warrior-Poet. Vehk needs no base introduction in such a publication as this; I may skip my introductions. This is no academic piece; I’ve misled you with the preambles, I confess. I speak to no experience but my own, and beg no apologies for it. There is power in seeing and feeling seen in return, in finding something you recognise as “Like You” on the other side of the screen. The first and only time I experienced this, in my younger years, was in Morrowind. I was lost in Balmora, reading through the Sermons for the first time, joyously failing to decipher the kaleidoscopic wordplay. It was exactly what I imagined a mortal-born god trying their best to translate the divine to sound like. At first, it seemed like nothing made sense; a common state for most first-timers, I imagine. Still, it felt like I was almost-reaching something important: being tantalised with understanding just slightly beyond my grasp, but urgently proffered as meant for me. I was stubborn. I gnawed apart each line as well as I was able, maddened myself with it through insomniac nights and shuddering train-track days, filled notebooks with nonsense and occasional insight. I had little else to do, and the obsession felt better than the nothing. I had a blackness in my heart, a numbing cold that had taken away my appetite and sleep and joy, left me a deadened shell of myself. When the numbness passed, without my compulsive study to distract me, I could only feel a bone-deep and heavy despair, or a reasonless rage with nowhere for it to be aimed but inward. I was sick, in the way that I had been sick since I had been ten. You can’t wear the trappings of what you are not and expect to truly become it, but I had tried. I could have worn the aesthetics of femininity like the girls around me, could have called myself Woman like the body I was given was true, could have kept a woman’s name and a woman’s smile and a woman’s pain as I had been taught, as had been sometime forced into me. I had tried. Though I had been born to all of that, though, none of it had made me a woman, something other women and my own heart were quick to teach me. Once I had learned there was such an option, I tried the other way. It was a long-fought battle, one I had sacrificed a home and a wife and the love of half my family for, not without regret and great suffering. Passing for a man, though, did not make me entirely a man, but I had tried; none can say I didn’t. But being too long a girl-child and unwilling to strike the past self entirely from the new, I moved and spoke and gestured in a way that was immediately and noticeably Wrong amongst men, and seemed ever more noticeable the more I tried to hide that wrongness in the learned cadences and rhythms of the others. I felt I had failed at being female and at being male, at a very dear cost, and didn’t know there was any other way to be. After what in retrospect was a severe breakdown, I’d found something, someone I could recognise myself in. Having grown up in the country, in a world that denied that anything like myself could exist, where anything bearing the slightest similarity was only ever punchline or prey, how can I explain how much that meant to me? 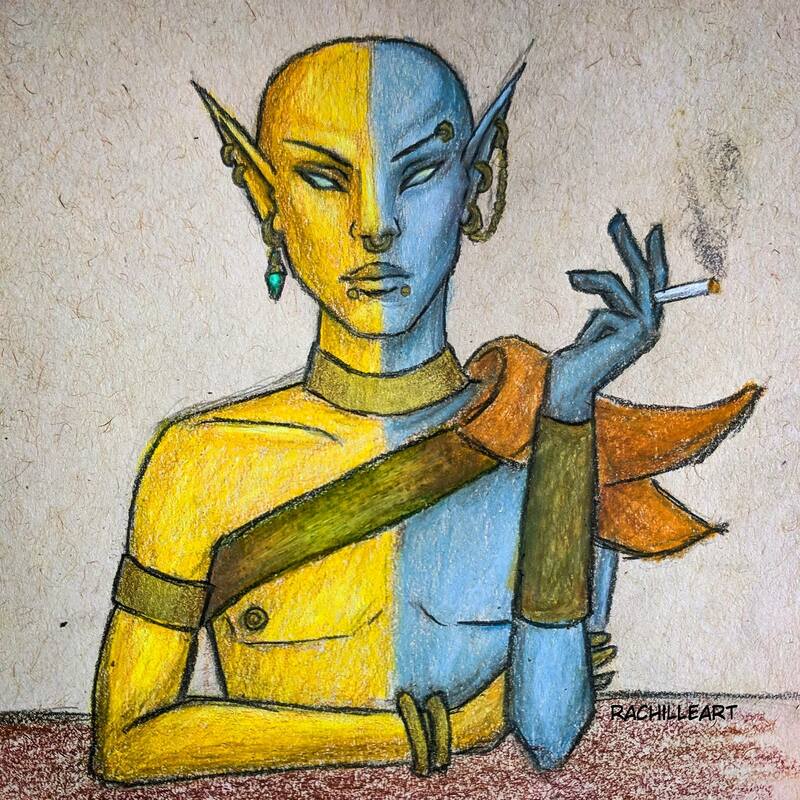 The revelation of Vivec as neither and both, as nonbinary, shook me deep. 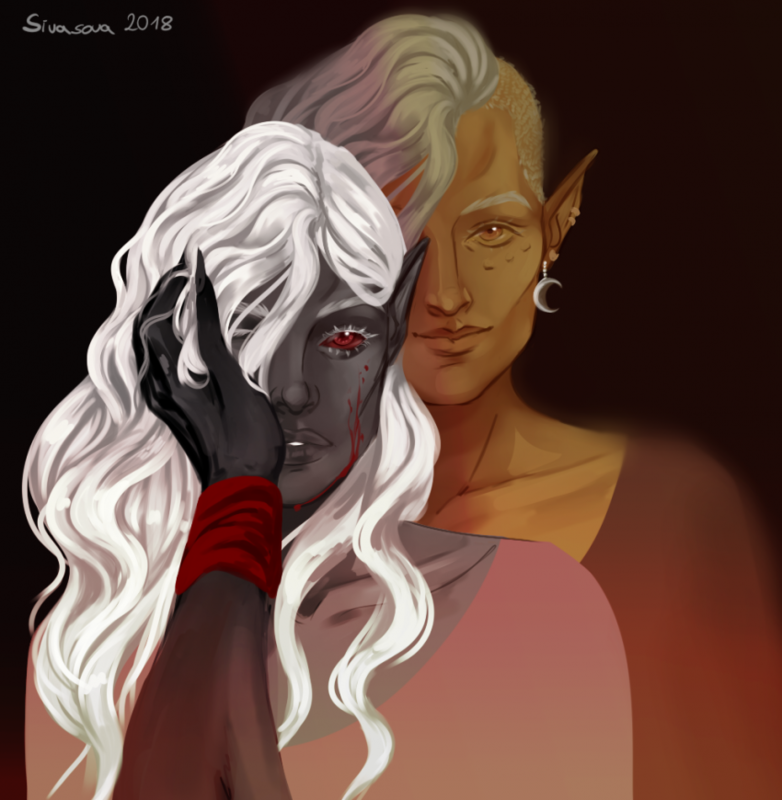 More to the point, as I read and learned, Vivec was that rare and impossible pairing: they were both nonbinary and powerful. Neither trembling dirt-road prey or plague-bit obituary-in-waiting, not another slow-burn joke that I was never meant to be in on, but a force of violence and wisdom and unquestionable, inviolable strength, identity inherent and whole. Vivec took their gender, their sexuality, what had made them strange and threateningly Other and made it holy, made it a weapon, dared you to ignore or malign it ever again. Vivec had such perfect assurance in themselves and their own worth that it had become literally mythic. They were a blaze of bright, blue fire, lighting the blackened corners of my mind. They were a storm inside my heart, a gale of embers, inescapable; after so much void-cold nothing, feeling anything this strongly felt like agony. I could not imagine anything more beautiful than they, and how badly I wanted to taste strength like theirs, hold it as my own. That night, I remember, I slept like the dead. I started eating again. I did not get better overnight; it takes constant, patient, exhausting work, day after day, along with the right medicines and a lot of good help. But I did have something to follow, some light to reach towards, a constellation by which to set my course. I pored over the Sermons again, and again. Each time, a little more stuck with me, another direction to work myself in. (And I worked as best I could, though I did not learn the correct way– the metaphysics takes longer to take root in my head. But then again, to take only a single correct meaning from anything written with Vivec’s name would seem almost like insulting them with laziness.) Swallowing shrine-quotation taught me a better set of virtues than the ones that had been beaten into me. I cut myself into better shapes, setting aside old fears and unpicking the threads of lingering trauma. I learned how to hold myself in a way that felt right and powerful, how to speak my truth into the world. I began to see myself as something worth prizing, worth honoring, worth worshipping with my every breath. Move, and move like this. I learned by Vivec’s own example how to become. Like all things of great value, it is a vast and exhausting effort, a long road of suffering and joy without end. Often there is pain, as there must be; the world is still the world, and it has no shortage of agonies in its teeth. I am not yet without fear, and the old wounds are many. But, little by little, I am carving my way towards a distant and golden dawn, one I am determined to live to see. To build strength from my own scars, to bend the world’s denials beneath the iron of my will, to believe unquestioningly in my own self-loved holiness: these are the things I am choosing to take from Vivec’s wisdom today. I am trying, hard, to learn them well. Tomorrow will be another lesson. The room smells of sandalwood and nag champa. It’s soothing, rich and sweet. Gnisis, the town I return to so often, is always precisely as I left it, the benefit of having a paused little world to visit. The town name tickles my pagan sensibilities; the place to find the meditative calm I need, to find the ‘I’ in Gnosis. Gnisis contains two things of great worth to me: the Shrine of the Mask, along the road of pilgrimage, and Sermon Twenty-Two, the book containing the quote above. The Sermon, a book of the murder-and-marriage of old things into new, it silences me inside to read it in the way of all good revelations. It reminds me that there are no shortcuts to truth, that my suffering and effort is worthwhile even when it seems fruitless. The journey to knowing yourself, unflinchingly, for who and what you truly are is… Frightening. It’s comforting not to analyse, not to confront what might make you different, to accept others’ images of you. It is easier. It is often, by many measures, better to uphold the lie, by which I mean safer, and temptingly so. Sermon Twenty-Two reminds me that my work is vital, for all its pain, and that I must not be swayed by the embellished sweetness of old lies: it is better to put those old ghosts to death, and make something better from their bones. The Shrine of Justice, on the other hand, offers comfort in the image of Vivec’s tenderness. The false ash mask on the altar is beautiful and easy to find, but the true mask resides secretly in a pillar of strength, shaped like the name of God. I read of Vivec’s tears weakening the ash encasing them like stone, and think of how much value there may be in weeping, in releasing yourself from smothering silence and false masks. I read of Vivec clawing away the ash from their followers, how they breathed healing life and cleansing into deadened lungs, and I make parallels on how deeply the written word (here, the breath of the Poet) can heal you, rouse your soul and clear away its sickness, if you can just take it in. I think of the ash falling down upon the sleeping pilgrims, and contemplate how deadly it is to succumb to the desire to stay still, to stop moving forward, to stagnate: to refuse to grow and move is to admit you are already dead. My character crouches, as close to kneeling as the controls allow, before the true Ash Mask of Vivec, held safely in its column. I listen to the crackle of digitised fire through my computer speakers, the soothing grumble of the Ordinators. I am safe here. I contemplate the Lessons I have read, letting the words run through my mind like water until the day’s many aggravations wash away, until my thoughts are drowned out. I meditate on what I have learned, holding the peaceful quiet inside me like the beginnings of a star. My character lays down a potion of Cure Common Disease, the expected offering. A part of me prays for merciful justice, for strength, for healing. My character receives Vivec’s Touch. For a moment, I swear I can almost feel it.